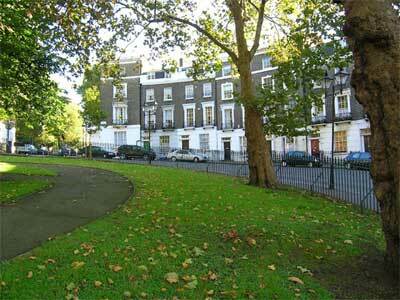 Percy Circus was laid out and designed by William Chadwell Mylne for the New River Estate. It is named for Robert Percy Smith, a director of the New River Company and brother of Sydney Smith, the English clergyman and essayist and one of the founders of the Edinburgh Review in 1802. The circular garden is on a sloping site with paths, raised beds around the centre and mature trees, shrubs and the original C19th railings. This 'residential circus is an oddity indeed, all but unique in London - the vanished Polygon in Euston was probably the nearest parallel - and further, it is built on a steep hill' (Mary Cosh). There are five entrant streets into the Circus, which is surrounded by various C19th houses with attached railings. Part of Percy Circus was lost and another part demolished for the Royal Scot Hotel, which was built with a replica façade. The Hotel was on the site of No. 16 and has a plaque with the information that Lenin and his wife stayed here in 1905 when attending the 3rd Congress of the Russian Social and Democratic Labour Party. Current improvements at Percy Circus are currently underway, including re-cutting and re-laying all the York stone paving; new tarmac perimeter path; formal yew hedge edging; selective tree removal to improve sight lines and let in light and two new borders of shade tolerant plants, including geraniums, crocosmia and other colourful flowers.